"Error 27502. Could not connect to Microsoft SQL Server <servername\instancename>. DBNETLIB][ConnectionOpen(Connect()). ]SQL Server does not exist or access denied. (17)"
The error does not affect the currently installed Cora SeQuence system, but the installation does not continue. 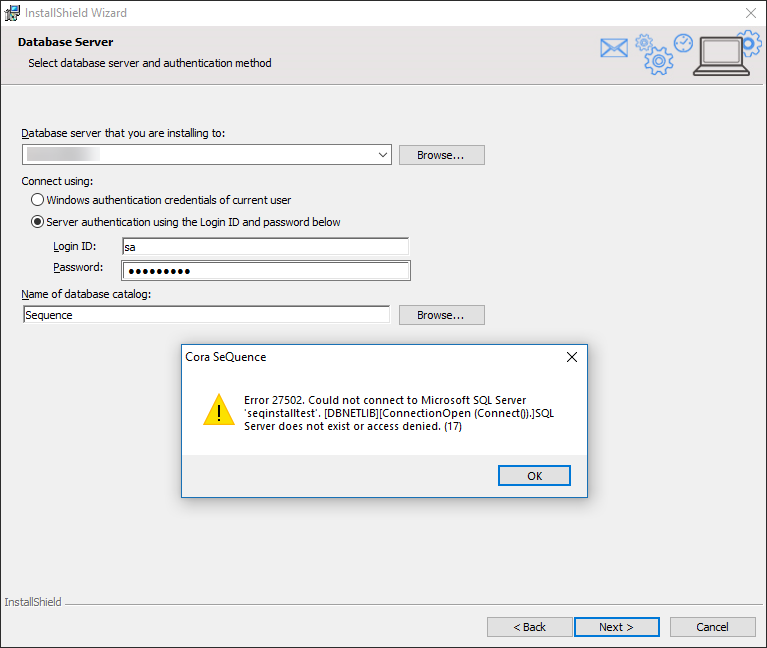 The SQL server on which Cora SeQuence is installed allows only TLS 1.2 connection. Hardening server security standards can block older and vulnerable security protocols, such as SSL and earlier versions of TLS. Today’s recommended practice is to allow only TLS 1.2. This issue applies to all versions up to 8.6 (inclusive). Later versions will include a fix for this issue. Make sure that Microsoft SQL Server 2012 Native Client (x64) or later is installed on the Cora SeQuence server. Copy the MST file from the downloaded ZIP to the same folder where the product installer setup.exe file is located. Run the setup with the transform and logging arguments. Replace C:\ with the relevant location of the setup and MST files. Note: To obtain MST files for earlier versions, contact support@pnmsoft.com .